The Yoga Center Reno (TYC) occasionally has class time slots available for rental by qualified and dedicated yoga teachers and teachers of other movement/healing arts. We also rent the space out for other activities, such as photo shoots, small private gatherings, and other events. Read below for more details. The Yoga Center Reno is a serene studio located in the beautiful 720 Tahoe Street Building in the heart of Reno’s Midtown District. It is approximately 725 square feet with bamboo floors and a tranquil atmosphere. Please stop by either just before or just after a class to see the studio for yourself (check TYC website for our weekly class schedule). The Yoga Center Reno has a variety of props: sticky mats, blankets, blocks, straps, sand-bags, and some chairs. There is a parking lot of the building and free and metered street parking within blocks of the studio. The Yoga Center Reno is ADA accessible. 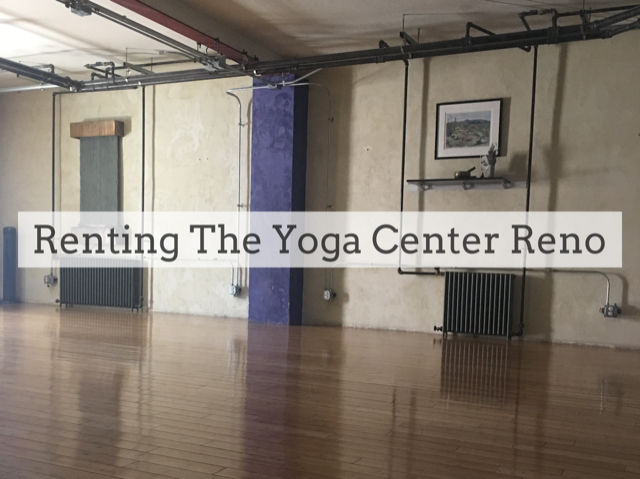 Unlike other yoga studios, The Yoga Center Reno does not pay teachers to teach. Our teachers are independent contractors who run their own classes/workshops out of our studio. This model is one that gives instructors a lot of autonomy and supports them to have a direct relationship with their students. It also allows teachers to generate more income than they would under other studio models. However, for instructors, it is an initial investment of time, energy, and money. Class times open up periodically for new teachers. Please contact the studio (info@theyogacenterreno.com), send us your resume, and let us know if you are interested in offering a class at a particular time. We are always on the lookout for experienced, well-trained yoga instructors who are interested in joining our team. The rent is $25/hour ($31.00 for a 1.25 hour class; $37.50 for a 1.5 hour class, etc.). A 6-month commitment is required, but teachers are encouraged to commit for a year, as this is the minimum amount of time needed to grow a healthy class. 50/50 Rental Fee First Three Months—teacher pays The Yoga Center Reno 50% of whatever they take in for each class with a maximum of $25 (or $31 for a 1.25 hour class, etc.) going to The Yoga Center. TYC Weekly Class Schedule: We update and print out a paper schedule of our weekly classes and post them at the studio. Includes teacher names and fee structures. Images announcing new teachers/classes for posting/sharing on social media or via email. We update our website with teacher bios, headshot, contact information and links to personal websites. We send out monthly newsletters to stay in touch with our community and keep students informed about happenings. Teachers are invited to provide editorial content for these newsletters to help promote their classes. We will announce new classes/teachers in this newsletter. Teachers are responsible for collecting their own fees, keeping track of their student base, marketing their class, building the class size. Teachers are responsible for finding a sub when they are unable to teach (substitute teachers must have liability insurance.) Unplanned class cancellations are strongly discouraged as this reflects poorly on the teacher and the studio. Official studio holidays are January 1 (New Year’s Day), President’s Day (in February), Easter Sunday (in March or April), Memorial Day (in May), July 4 (Independence Day), Indigenous Peoples’ Day/Columbus Day (in October), Thanksgiving Day (in November), December 24/25. Teachers must show proof of insurance, through Alliant Insurance Services (through Yoga Alliance) or another reputable insurance company, with The Yoga Center named as an additional insured. In addition to the marketing support that The Yoga Center provides above, the teacher is responsible for marketing and promoting their own workshop. The teacher handles registration and student communications for the workshop. If you are interested in using the space for a private event (photo shoots, small private gatherings, etc.) the fee is $35/hour. All renters must have liability insurance and provide a copy to The Yoga Center Reno. Contact info@theyogacentereno.com for available dates.